Southside Group wants to demolish 183 King Street, built 1892. Not for any particular reason, mind you. According to Paul Hubert, Chair of London's Planning Committee, Southside has no stated plans for a replacement structure. 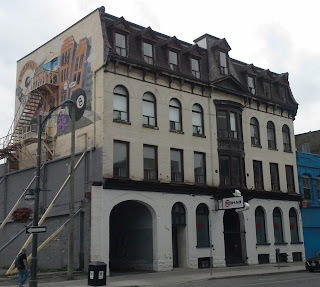 And although empty, the Second Empire style building isn't falling down, isn't an eyesore, and just happens to be in the Downtown London Heritage Conservation District. So here's an opportunity. An opportunity to create attractive offices, charming condos or apartments. An opportunity for a restaurant or night club to open on the ground floor. An opportunity for new residents, employees or visitors to drive through the old carriageway to park behind. An opportunity to inject some more life into this section of King Street. An opportunity for adaptive reuse, which is what a creative city does with its historic buildings. I'd like to suggest a new heritage organization for London. One that attempts to connect buyers or tennants with appropriate heritage buildings so that the structures are used, not empty and deteriorating. An opportunity like this just shouldn't be missed. Update, June 16: Southside, through their lawyer, is now suggesting a compromise in which the developer preserves "some heritage aspects" of the building while making room for a highrise. In other words, preserving the façade. Perhaps the carriageway could be the entrance to the underground parking garage? Or maybe they could paste some bricks on the outside of the new tower, making it reminiscent of the Talbot Block/Budweiser Centre? Update, January 15, 2016: Developer Vito Frijia states 179-181 and 183 King constitute a "fire trap" that's "beyond repair." Sounds like he's been practicing demolition by neglect already. 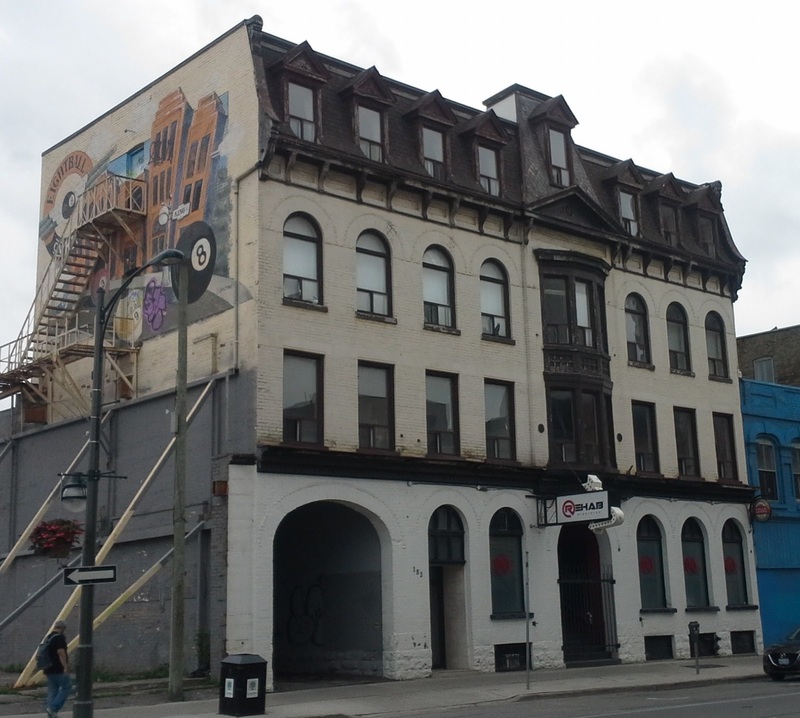 Since the city has told Frijia at least the façade should be preserved, he intends to take his case to the Ontario Municipal Board. The city wants additional heritage protection for the buildings, but that means a) saving the front 30% only, and b) if they're destroyed, they have to be "rebuilt." Rebuilt? Like Adam Beck's home? A "rebuilt" structure is no longer a heritage building. Why can't the developer just build in the parking lot next door? Update, May 16, 2016: A city-requested engineering report states that the blue building, 179-181 King, is too run down to save. The report does not extend to 183 King next door. This is a building that I have walked by many times and only with this photo have I noticed the lovely architecture. It seems there is still some original slate on its mansard roof face. Thanks for sharing, the update "seems" encouraging. What are you smoking Jennifer? 183 King Street needs to be demolished immediately and people like you, Ward 8 "Career Politician" Councilor Paul Hubert, Jim Yanchula and John Fleming – non-elected employees at The City of London that need to get a grip on reality and get out of the way! What business and development experience do you have Jennifer? Tell me "who" in their right mind would buy 183 King Street under your conditions? You, Hubert, Yanchula and Fleming obviously don't have to look at this dilapidated eyesore regularly like I do and I doubt any of you have ever been inside of it. I have and as a current resident of the downtown core, I have to look at it regularly and it is disgusting, worn out, run down and outdated. It’s a disgrace. Over the next few years, an empty lot would be much better than what is there now. I also know that in all probability, no developer will take on the property if they have to spend hundreds of thousands of dollars just to preserve it for a handful of "kooks" without vision and no Financial Institution will provide any type of mortgage on the property in its current state. This building and the one beside it epitomize everything that is wrong with London, ON. Again, I say level it and also level 179-181 King Street as soon as possible. The City should be bending over backwards to accommodate any developer that wants to demolish the existing buildings. It is only the front part of 183 King that has any history & character at all and what character it does have is "tired and old". The back part of the building was added long after 1892 and holds no value whatsoever. It brings shame upon all Londoners - especially so close to Budweiser Gardens and the well-kept area just west of Richmond. As far as "heritage" value is concerned, my Grandfather was a good looking and highly functional man in his day and was part of several historical events here in London. However, that does not mean I should have saved his bones, covered them in shellac and put them on display for future generations just to "preserve" history. Sometimes you just have to let things go. You are a heritage zealot. I am all for preserving our history and heritage, but, these buildings are NOT worth saving. I say put up a high rise building with a façade that has historical character, incorporate a green space court yard along the west side with three levels of underground parking and bring more people permanently into the core. Hey, here's a wild idea; perhaps a Food Basics grocery store or Giant Tiger on the main floor of the new building would be of greater benefit to the people living TODAY!!! There are absolutely NO Supermarkets downtown at all. Bunch of boneheads at City Hall. This is what you get for electing politicians that spend most of their time chasing various committee memberships – simply for extra power, control and for the extra dollars they get paid! All in all, it tells us all that it’s not really just the politicians that are to be blamed, Hell, we can vote those types out. It is the likes of Jim Yanchula - Manager, Urban Regeneration for The City of London and his partner in crime John Fleming – Planning Director, - both, non - elected employees, that impede London's downtown recovery. Where is the accountability? Vision anyone??? Not in London! It’s the blind leading the blind. Ask most people what to do with the site(s) and I am certain they would agree with me, especially if you took them to the building in person. The least The City of London should do is to lower the Municipal Property Taxes of all properties within 500 meters of these ramshackle buildings. Please stop the insanity. It’s been going on for far too long and the people deserve better! That what I think Jenny.